I can’t wait until Space Coast! Herons and raptors and rails and gulls and ducks and cranes and jays and owls and alligators are all awaiting me – and you – at the Space Coast Birding and Wildlife Festival. You are going, right? 5. Add Nanday Parakeet and Budgerigar to my ABA Life List. This goal will either be reached or missed before the festival actually starts. I fly in to Orlando early Tuesday morning and I will immediately head west to Tampa in search of these two countable exotics. If anyone has good advice for tracking these birds down I would love to hear about it in the comments! 4. Show lots of good birds to lots of birders! I’m co-leading four different field trips and co-leading trips means doing your best to get good looks for participants at good birds. May I be quick in adjusting my scope for the vertically challenged, may the weather cooperate, and may the birds stay still! 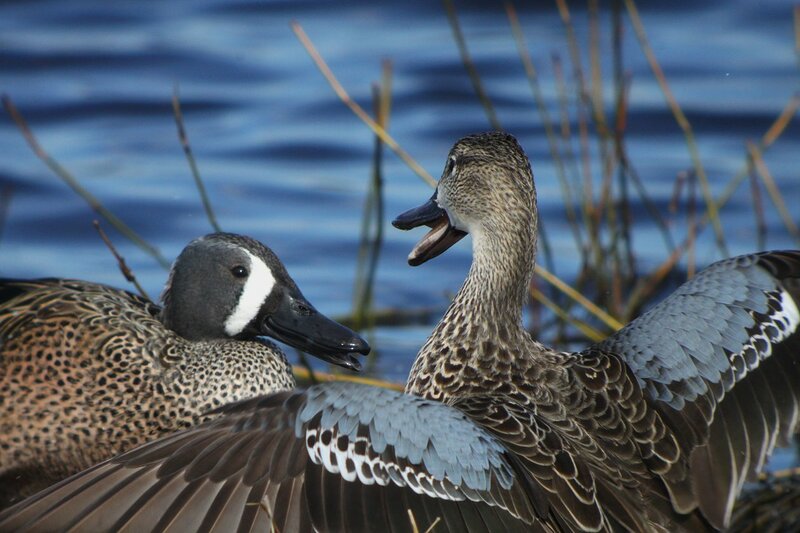 Blue-winged Teal like these at Meritt Island National Wildlife Refuge in 2012 certainly count as good birds. 3. Eat lots of good food at Dixie Crossroads. Dixie Crossroads Seafood Restaurant is an Eagle-level sponsor of Space Coast and a delicious one at that. What that sentence means is that Dixie Crossroads has lots of yummy food, not that I am going to start taking bites out of the restaurant. That would be weird. 2. Lobby Jeff Gordon, president of the American Birding Association, to make the Green Heron the ABA Bird of the Year in 2015. No bird is as cool as the Green Heron. Yeah, Rufous Hummingbirds, 2014’s selection, are cool. But Green Herons are obviously cooler. And greener. And heroner. Or something. I will lobby the heck out of Jeff or at least make myself so annoying that he agrees with me just to make me go away. Maybe standing in front of his scope when he is trying to see a good bird will work. Yeah, that sounds like a plan. Who’s with me? 1. See (or at least hear) a Black Rail! Black Rails failed me in 2012. I will not let that happen again even if I have to sleep in a swamp. I really don’t want to sleep in a swamp so I hope that they show up for me on the Black Rail field trip this year! Whatever your goals are at Space Coast I am sure that you can manage to meet them if you bird hard enough. So get out there, check out some birds, and have a good time. That’s why you go to Space Coast, right? 10,000 Birds is a Scrub Jay level sponsor of the 17th Annual Space Coast Birding and Wildlife Festival. Nanday Parakeet is a fairly reliable regular on the wires just inside the entrance to Loxahatchee NWR in Boynton Beach. Thanks, John, though that might be a bit far south for me to get to. And good luck with Black Rail.